#BEST CASUAL SHIRT MANUFACTURER# Who says men’s fashion is boring? The trends in men’s fashion are ever changing.What is in today will be out of market tomorrow. Again with the magic touch of some designer, these shirts will become fashion trend again. It is true that the formal, solid colours shirts are perfect for any man, but since last two decades designers are experimenting with various trends, colours and patterns of shirts. It resulted in the invention of casual shirts.They are fashionable, they are cool, and they are perfect to make you glamorous at any outing or clubbing. The preference of colourless or pale coloured shirts has long gone.Now men are opting for the bright colours which used to be known as women’s choice.Purple, yellow, electric blue or even pink are becoming popular amongst women more and more. Now when buying shirts men are not just thinking about what will work best with suit.They are thinking what will work both as office attire as well as casual attire. Since the style of wearing shirt is also changing, while you are hitting some high street store or logged in to buy casual shirt online, you might come across the throng of collections.The semi casual shirts are now the popular choice. They can be fun clothing for office.If you are planning to go the club after office then it will be your best bet.Team it up with single breasted jacket to achieve a perfect semi casual look at any outing or part.#BEST SHIRTS SUPPLIERS# click here to view our latest Designs www.t-zerr.com The two confusions that you must have been in whether to opt for full sleeve or half sleeve and the shirt should be tucked or untucked. Typically full sleeve shirts are formal and the half sleeve shirts give a holiday vibe.You can opt for the shirts that have sleeve button and you can roll them up to appear as the hot casual guy. Opt for shirts that are short so that you don’t need to tuck them in. Untucked sleeves rolled up shirts are perfect as casual attire. Choose a vibrant or pale colour as per your personality and style it casually.Trust me, we will fetch many eyeballs at any casual outing. SHIRT MANUFACTURER If you belief in class we have the best quality outfits with wide range of shirts like casual shirts, check shirts , half sleeve shirts , cotton shirts. we are Gujarat based manufacturer having our head office in surat. so please get in touch with us to look into some best Designs . Best Shirts For Men Are you looking for something New and Fresh ?? If yes Then you Wait is going to End Soon. We are coming us with our new Set of Designs with unique Touch of Feel and Color . 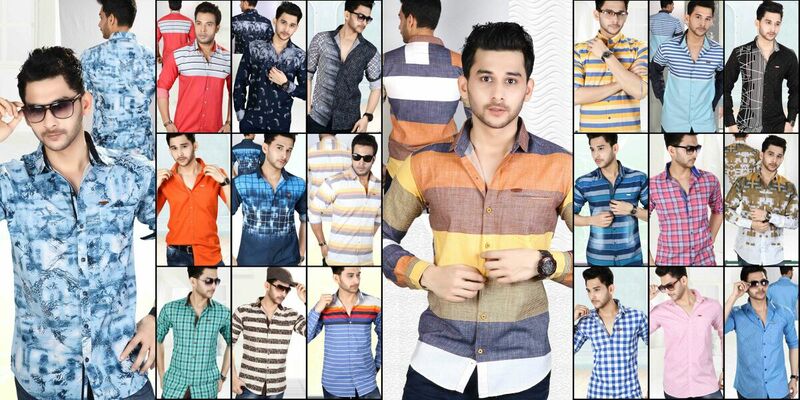 we are all set to intoduce some latest collections of Mens Shirts at best affordable Price.